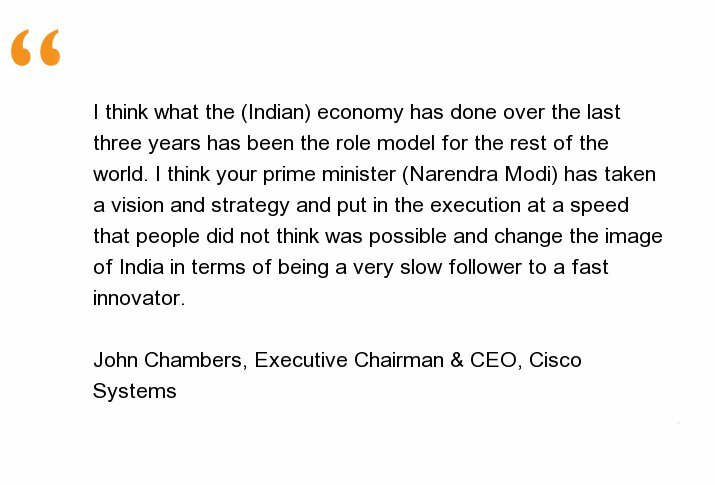 “The reason I have been so bullish on India is that I always believed India had the potential… Under Prime Minister Modi’s leadership, India has become a fast innovator …. I am a huge believer in him, outline hope for people… then he says why this is possible, and then even probable,” John Chambers, Chairman of CISCO, the Tech Behemoth said. “Narendra Modi is one of the top three leaders I have ever met!” he added with a big smile on his face. 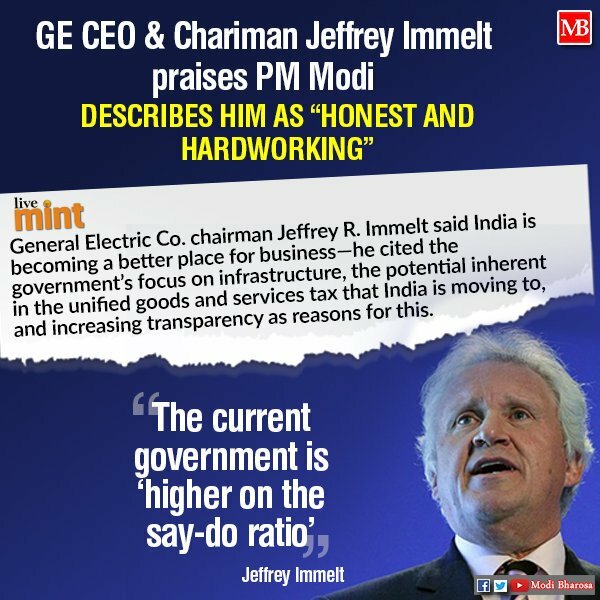 “PM Modi has been a good leader … If you look at somebody that is forceful, hardworking, honest and transparent, I would say sign me up,” he said. “In my view, it (demonetisation) has created a lot of bank accounts. It has reduced corruption that you don’t know about; poured a lot of the things back into the real system; so it has all those benefits,” he said. Jamie Dimon also rubbished fears that GST would cause the GDP growth to suffer. 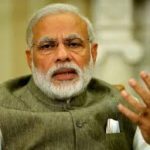 It is notable that all three luminaries who have heaped rich praise upon NAMO are visionaries in their own right and have a good idea of business and economic issues. Also, the three are not alone in expressing confidence in NAMO’s policies. 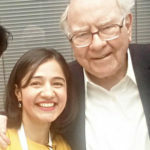 Earlier, luminaries such as Warren Buffett, Prem Watsa, Mark Mobius, Hugh Young of Aberdeen, Bruce Flatt of Brookfield, Richard Rossow, JC Paretts etc have also confirmed that the Government’s policies relating to demonetization, Aadhaar and GST are taking India in the right direction. Even Jim Rogers, who had earlier trashed NAMO’s policies, turned around and grudgingly gave NAMO credit for his actions. “If Modi continues doing stuff like GST, then not just me, everybody has to pay a lot more attention to India,” Jim Rogers said with a sheepish look on his face. Ridham Desai, the visionary MD of Morgan Stanley, could barely control his excitement as he was being grilled by Latha Venkatesh and Anuj Singhal of CNBC TV18. 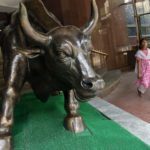 “We think India’s stock market could be among the world’s best performers in the next ten years, leading to India’s market cap rising from $2 trillion to $6 trillion. We see the BSE Sensex crossing the 100,000 mark, albeit the bulk of the returns are likely to be front ended in the coming five years,” he proclaimed emphatically, grinning from ear to ear. As expected, Latha Venkatesh and Anuj Singhal had a skeptical look on their faces. They demanded that Ridham provide a cogent explanation for his theory. Ridham provided a masterful and convincing explanation. He pointed that there are two pillars on which India’s digital leap is based, namely “JAM” (Jan Dhan, Aadhaar, and Mobile) and GST. Ridham explained that the consequence of JAM is that in four or five years from now, there will be 700 million smartphones in India and there will be a billion people with internet access. Almost every household in India will have a bank account. Also, there are 1.2 billion people who are biometrically identified due to Aadhaar. “The implications of this actually go beyond the stock market, they go beyond the economy. They go into areas such a security,” Ridham said. “I am convinced that a lot of countries are going to come to India and will want to understand our Aadhaar architecture because the Aadhaar architecture I think is a big breakthrough in terms of technology,” he gushed in admiration at the achievements of Nandan Nilekani. With regard to Goods and Services Tax (GST), Ridham explained that it brings two big changes to the fore. The first is that because all transactions will be accounted for, banks will be able to lend on the basis of cash flows instead of insisting on collateral. This means that millions of micro and small enterprises who have been outside the formal credit system will now be able to raise funds from the formal banking system on reasonable terms. The second is that because compliance will go up, the revenues of the government will surge. The increased revenues will be used by the government partly for increasing the spending and for reducing debt. A reduction in the public debt leads the stock market multiples to go up because private investment increases. Ridham also lauded GST for being “completely online platform”. “Nowhere in the world is tax system as online as it is in India. So nobody has done this before and JAM which also no one has done, so, India’s digital leap is not there anywhere else in the world and that leads to all these forecasts that you talked about,” Ridham said, with pride at the accomplishments of the Country in comparison to the developed countries. 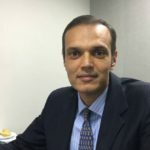 Ridham Desai made the astonishing revelation that India is the best performing stock market in the world in US dollar terms in the last 20 years. He emphasized that the gains have not come in a linear manner or in a straight line. There have been dips along the way. However, the Country has delivered in the long run. He also pointed out that the non-linear performance means that bulk of the 10 year performance will come in the next four-five years. “The headlines that are doing the rounds is that I have said that the Sensex is reaching 1,00,000 in 10 years; actually in the report, if you read the fine print, it is 1,00,000 in five years because after that I think you will enter a bear market. So the returns will be front ended because the markets will tend to price in these changes a lot faster than as the changes actually happen,” he added. NAMO has faced a lot of flak from the trading community for the rush with which GST was pushed through even though the systems were not completely ready to take the load. However, Ridham explained that the decision to rush through was actually a brilliant strategic decision by NAMO to ensure that all the pitfalls of GST are ironed out before the 2019 elections come into reckoning. “If this had not happened on July 1, I am fairly convinced it may not have happened at all because the impact is likely to continue for a year and hopefully, I think that is a bet of the government, that then it will fade away so that come 2019 when elections around, GST will not be an issue at all,” Ridham said. “My kirana guy was telling me to buy the things I need because there won’t be a supply for two months. I met him after few days and I asked him about it. He said everything is happening. There has not been a single day of supply disruption,” Ridham said, implying that people are getting their knickers in a twist for no reason whatsoever. He added that the other concerns relating to filing GST returns, mismatch between revenues paid and credit to be given and that micro and small enterprises will suffer are transitory and will get ironed out in the next few months. 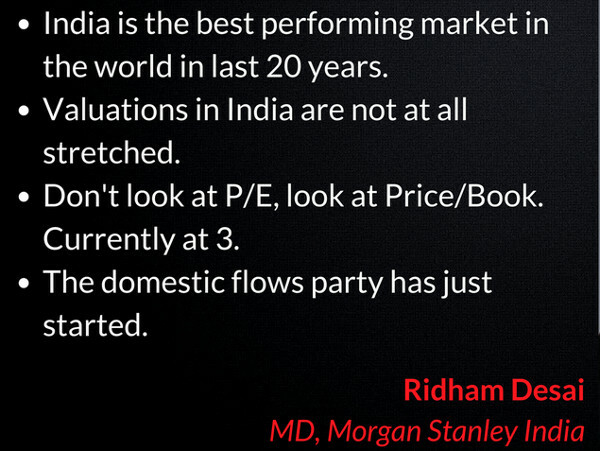 Ridham explained that in relation to other emerging markets, India has been correcting and underperforming for the past few months. He pointed out that while China is up 41 percent this year and the emerging market index is up 25 percent in dollar terms, India is up only 21 percent in dollar terms. “So India is underperforming and that correction didn’t start last month. It has started a few months ago,” he said due to concerns relating to GDP and demonetisation. However it is a good opportunity for long-term investors to engage and it will continue to be a good outcome, he added in a soothing tone. Ridham advised investors to aggressively tuck into blue-chip and fail-safe financial stocks like Bajaj Finance, Edelweiss, HDFC Bank, ICICI Prudential, Kotak Mahindra Bank, LIC Housing, Mahindra & Mahindra Financial Services (MMFSL) etc and also consumer stocks like Asian Paints. He explained that presently the financials sector is dominated by PSU Banks to the extent of a whopping 70 percent. However, the structural problem of the PSU Banks and the reluctance of the Government to pump in more capital into them means that the private sector banks and NBFC will slowly and steadily wrest market share from them. “The whole 70 percent, half of it maybe, is up for grabs. We see 300-400 basis points of market share shift every year for the next 10 years,” he said. Ridham painstakingly explained that there is also a change happening in consumer lending because youngsters are now culturally inclined to borrow money to fund their lifestyle. He pointed out that the consequence of this is that the market size will go up. He also emphasized that the consumer debt to GDP in India is woefully low at just 15 percent while it is 100 percent in the developed world and in China. “We are not even forecasting that we are getting there in the next 10 years. We are going to be a far cry from that number,” he added, implying that the scope for growth for the financial services sector is incalculable. He also pointed out that while the per capita income will be around USD 4,100, presently, out of every Rs 100 that is spent in the country, Rs 60 gets spent on food. However, as the Rs 100 grows to Rs 110, food consumption will not grow. Instead, the remaining Rs 50 will be spent on consumables. “Non-food consumption will see rapid growth. I fear that we will underestimate what will happen,” he emphasized. 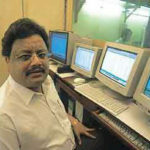 Ridham rubbished fears that Bank and NBFC stocks are trading at bubble valuations like tech stocks and the realty sector did in 2000 and 2007 respectively. “We are still far away from that bubble period where everything gets fancy valuations and people start doing funny things with their valuations. We have not gotten there. It is a little away,” he said in a soothing tone. What slowdown? Consumers are buying more premium products this festive season! 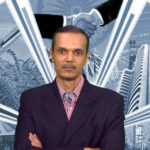 The reality of Ridham Desai’s analysis can be gauged from the fact according to a report in the ET, sales of cars, televisions and refrigerators have increased by more than 15 per cent this Navratri and Dussehra from last year. This has calmed concerns that the notebandi and the goods and GST will have a prolonged adverse impact on consumer sentiment. Even consumers in smaller towns are buying high-end television sets, such as 4K TVs that start at Rs 65,000, and large-screen models that hitherto were limited to the big cities. Companies have attributed the pronounced migration up the value chain to a good monsoon, availability of cheap financing options even in the hinterland and an end to supply disruption associated with introduction of GST. “The consumer buying power is back this Navratri … the impact of the GST and demonetisation is receding,” the head honchos of Sony India and LG Electronics were quoted as saying. When It Comes To Economics, Whom Do You Believe? Yashwant Sinha Or Morgan Stanley? 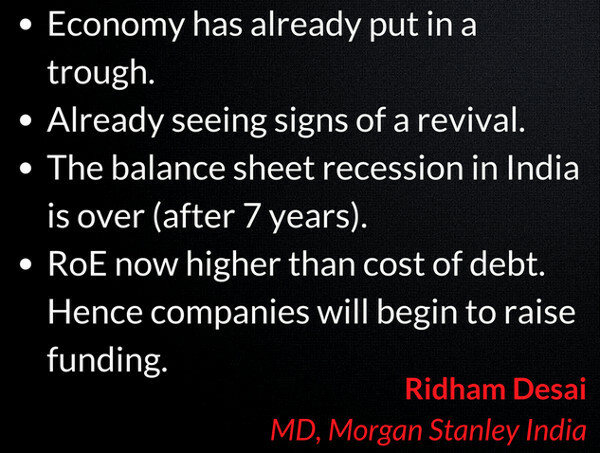 The bottom line of the advice offered by Ridham Desai and Morgan Stanley is that we should not be bogged down by short-term problems that arise in the implementation of the Government’s policies. Instead, we have to look at the big picture and think long-term. Even if the estimates made in the report appear extravagant and over-optimistic, there is no doubt that there is a lot of wealth that can be made from stocks in the long-term! But then why FII are pulling money out every single day in the last approximately two months. Why would some savvy investor like FII leave the party half way knowing that the real party has just begun. Yes you raised right question, for next few months I see market side ways or some chance of drifting slightly lower due to poor implementation of Demonetisation and GST, market may come down in dollars term with weak rupee. So in short term FII will be better of to buy in emerging market trading at lower valuations by selling India. But I expect FII selling to stop by start of 2018 but only if NaMo don’t come out with his third half baked idea. NaMo or any body else (as NaMo has done useless Demonetisation and poorly implemented GST) Sensex may touch 100000 on the back of Indian Enterpenures and 1.3 billion consumers. 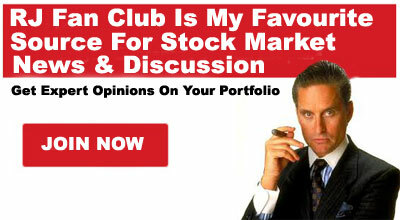 .Pvt financial and consumption are the best theme to play. HDFC Bank, Kotak, InduSind, Yes Bank, Maruti, Asian Paints, ICICI prudential insurance, Aditya Birla Capital, DHFL, L&t financial, Lic housing,ICICI Lombard insurance, L&t, RIL,, Ultra tech cement looks to be good bet in large and bigger mid cap. Smaller pvt banks like Fedral bank and DCB bank can be good bet in mid cap. Dmart may trade at market cap in lakhs in future if it’s growth remains intact. 99% of the economists will not tell you that more than 90% of the new jobs since 1991 have been in the informal sector that have killed by demonetisation and the high-tax GST. The significant push from informal to formal means increased productivity and short-term GDP growth spurt, which is good for the stock market in the near term, but also much reduced job creation (I estimate 75% lesser jobs), which is bad for wealth disparity, law and order, and the long-term GDP growth. Also, the effects that are positive for the stock market will not start showing before 1-2 quarters when Indian economy is out of the present economic “tailspin”. So, short term down, medium term very bullish, and long term much less bullish. Stock-specific investors don’t need to care that much about these trends, though. I agree. The Govt has actually failed to create jobs in the economy. Even the Govt has failed to create and nurture a right atmosphere for job creation. Every successive Govts have destroyed the entrepreneurial skills of Indian people in the name of excessive regulations and compliances. Agreed, you need to have regulation when the economy grows in order to protect common citizens but that can be done by rightfull and need based regulations and compliances. If every citizen is required to fill large number of forms to comply with some rules and orders (you look at the latest Income Tax directive whereby you are required to disclose your estimated future income in the next quarter and the tax payable on that – look at the absurdity of this directive – who knows where the market and economy will be tomorrow and what I will be able produce and sell and at what profitability). Jobs gained in 2 decades because of loose monetary policy and corruption! Not because everyone suddenly became scientists and inventors! Demographic dividend is only on paper! In reality we have crores of paper degree holders with zero employability or entrepreneurial skills!! This time we’ll need bigger urban employment program with Big bang infrastructure projects!! Only way! I need to comment because there are no expert voices here. The amateur views should be treated as such. Morgan Stanley is correct in their prediction. The economy is in an upswing for the future mid term and the current downfall by FII is nothing but trigger reactions from flock participants. With Domestic inclusion and prudent allocation the upside will be superb upon FII returns. Buy and Hold with a smile. Is there any technology to produce Rice,wheat vegetable,All these people making some hype out of nothing when Stock market is remaining undecided where to go at the Top. I think Demonetization was disaster, implementation of GST was also bad but with time they are making changes to GST to make it effective. So far as I think GST only helped manufacturing units and not retail units. Personally I do not think GST actually will have any long term effects on market because businesses usually have tendency to adapt but on other hand government is interfering too much in free market. Less interference will help small as well as big businesses to work with good potential. Right now I think markets will undergo correction because the upside we saw was right there since December of 2016.